WORKING HEIGHT 32'TOTAL HEIGHT STOWED: 7'5". PLATFORM HEIGHT WITH RAIL FOLDED DOWN IS 6'3"
PLATFORM LENGTH 96.25"PLATFORM LENGTH EXTENDED131.25" WIDTH 32"
16" TRAILER WEIGHT 4000 LBS. 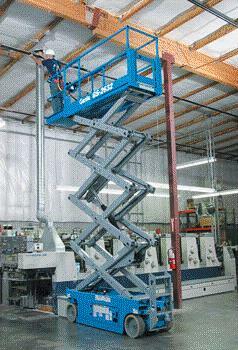 * Please call us with any questions about our lift 26 foot scissor rentals in Tulsa OK and neighboring communities in Northeastern Oklahoma.